Born in New Jersey, Karen Savoca's baby diary reads, "20 months, knows six songs." At the age of five, she was the emcee of her kindergarten play. Her mom had been a big-band singer, and the featured vocalist on a nightly TV show in Fresno, CA. She wasn't at all surprised to find her little girl constantly dancing and singing around the house. Although she dreamed of playing the drums, she was given piano lessons at the age of nine. At thirteen, the family moved to rural upstate New York, where her new friends were astonished by her ability to learn the lyrics to any song in just one listening. At fifteen, she bought herself a guitar with saved birthday money, and started writing songs. During her high school days, she was a frequent soloist in choir, and earned leading roles in both dramatic and musical plays. Her expressive alto was soon sought out by regional musicians, and she became a local coffeehouse favorite. Knowing that she wanted to pursue a musical career, she attended Syracuse University's Crouse College of Music. At the time, the school offered only classical studies, and to someone who had already found her own true voice, the operatic training was far too restrictive. After two years as a music major, she transferred to Elementary Ed, where she developed passionate views about early education. She joined a working band, and decided to remain in Syracuse after graduating. Born in Syracuse, NY, Peter Heitzman has long been known as one of the region's premier guitarists. He picked up the guitar at the age of 13, teaching himself how to play by listening to the Blues, Rock and R&B records he loved. After college, he toured for several years playing in rock and country bands. On a visit home, he went out to a club to hear a friend's band, and Karen was their new singer. They jammed all night, and Pete joined the band the next day. Powerful chemistry from the start, the two have been together ever since. Soon after they met, Karen and Pete moved to New York City where they gigged, worked strange temp jobs, wrote songs, and accumulated recording gear. Several years later, they returned to central New York where they converted an 1890's church into a recording studio, and founded Alcove Records. Karen and Pete formed The Mind's Eye, a band which featured a revolving membership of some of the best musicians in the area.The Mind's Eye played soulful, original music and took up residence at a club where they packed the house every Monday night for seven years, becoming a beloved local institution. Longing to tour, the duo split off from the band, and developed their unique sound. They have been described as a self-contained mini-band with "the fearlessness of a high-wire act working without a net." An elusive mix... melodic, funky and spontaneous. The duo's live performances are uplifting and hypnotic. As the sun was setting at the Vancouver Folk Festival in 1999, for the first time in 22 year years, 10 thousand people inexplicably removed their shoes and waved them over their heads for what Karen calls, "The Miracle of the Shoes." 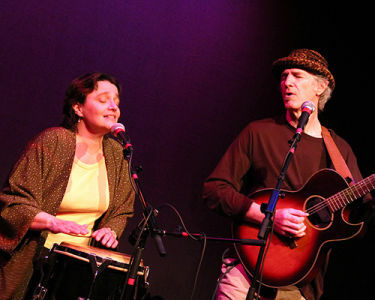 Joining Karen and Pete will be BC's own Shari Ulrich - a talented singer, songwriter, muilti-instrumentalist, film composer, songwriting educator and actor.